ESL School in Brooklyn Heights, New York, the village in the city! ESL Awards "School Facility of the year 2017 + 2018"
ESL Awards "English School of the year 2016"
Learn English in Brooklyn, NYC. Small and Intensive English classes at our ESL school in New York. Standard, Semi-intensive, Intensive (for F1 students), Individual, Combined, and Business English programs. We offer year round English courses and short English courses in New York. 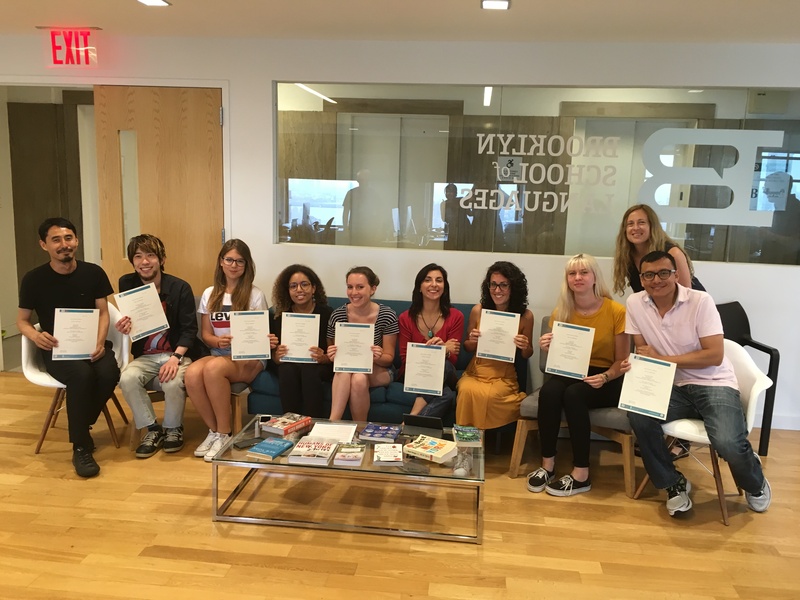 Situated in picturesque Brooklyn Heights on the 34th floor of a landmarked historic skyscraper overlooking the entirety of the city, our New York language center is the ideal location for an ESL school in New York. 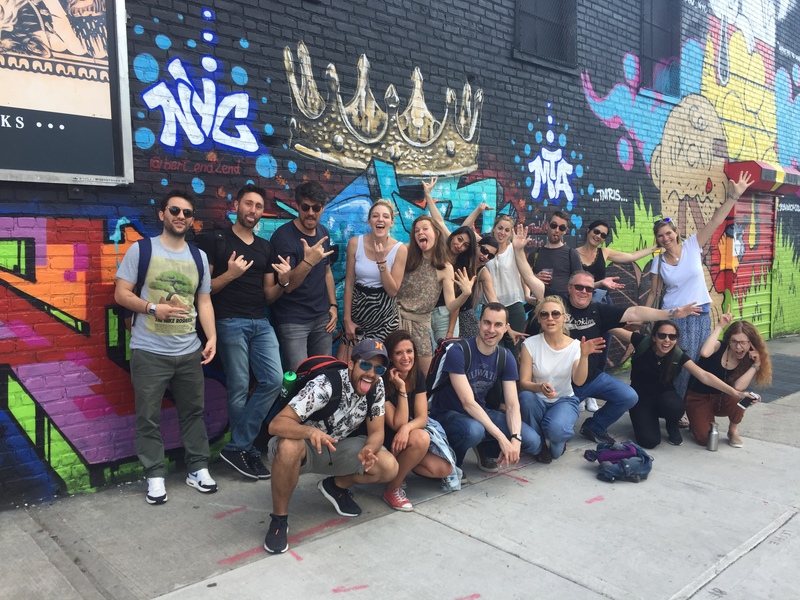 Learn ESL in New York and be part of a real NYC Community! Our ESL school in New York has modern classrooms and facilities with stunning views of Manhattan, free fresh coffee every day, and free WIFI. We offer small, intensive English courses in New York (12 students max for general English, 8 max for Business English). Students can start on any Monday throughout the year. 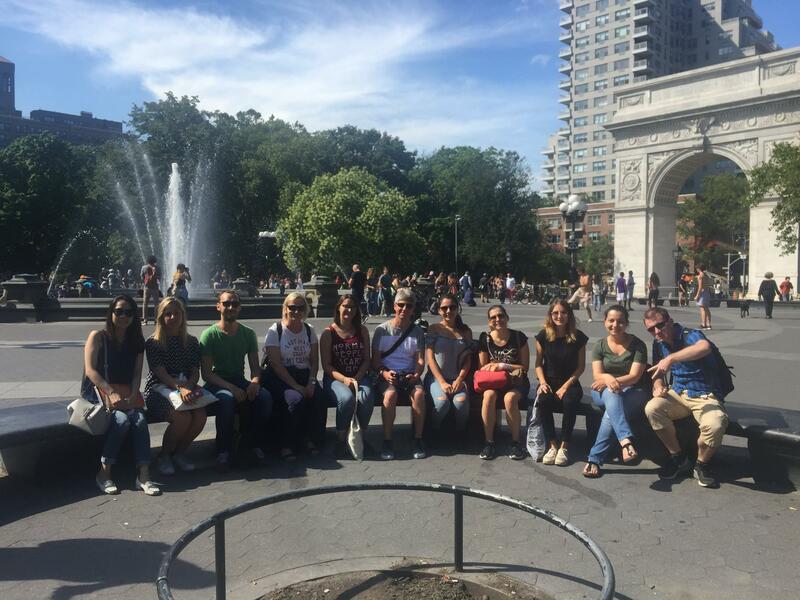 Our Junior ESL school in New York offers a full program of afternoon activities and weekend excursions to discover the city. 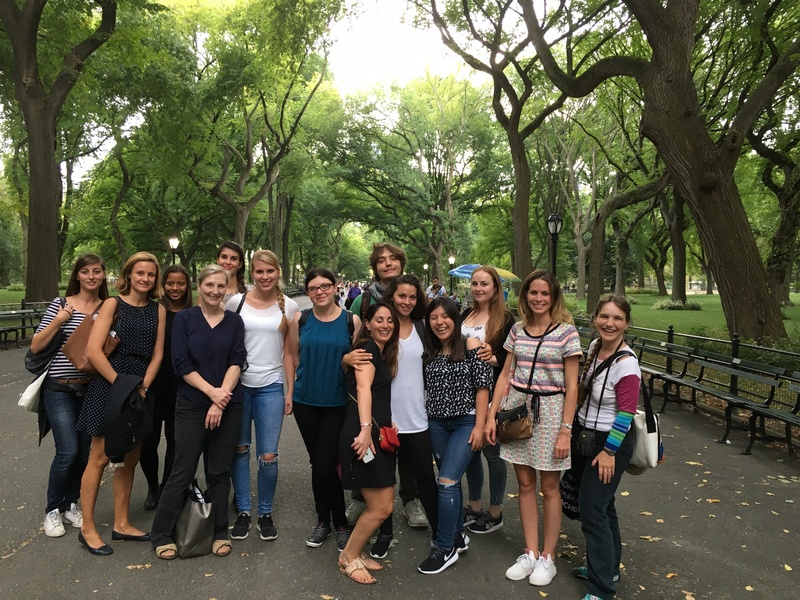 Our summer junior English camp in New York is for 13 to 17 year olds, and runs for 5 weeks from June 30th to August 3rd 2019. 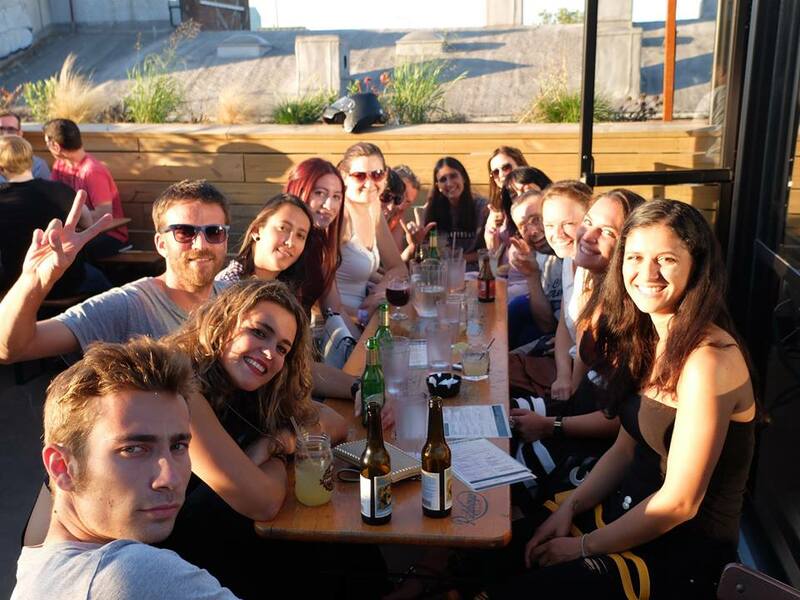 Students can choose to stay with either a local host family in Brooklyn or in our student residence, located just a 10 minute walk from the school. Course + Activities with no accommodation, and Course-only options are also available. Everyone is really kind and helpful. Everyone knows your name and smiles at you. They care about how you’re doing and try to help. Very friendly and warm, always present. The staff are all friendly and so nice. I see this is a good workplace for the staff, and it is important to offer a good environment for the students to learn. I really appreciated the help at school. I think not every school helps the students so much and so fast. You are all great people, keep doing what you’re doing! Thank you for helping me not only at school, but in NY in general. Very friendly and easy-going! They make students feel comfortable about speaking English with staff and other students. Everyone is friendly, available, competent, and also funny! I was surprised to see all the staff knows the students’ names. They are very kind and give good advice. 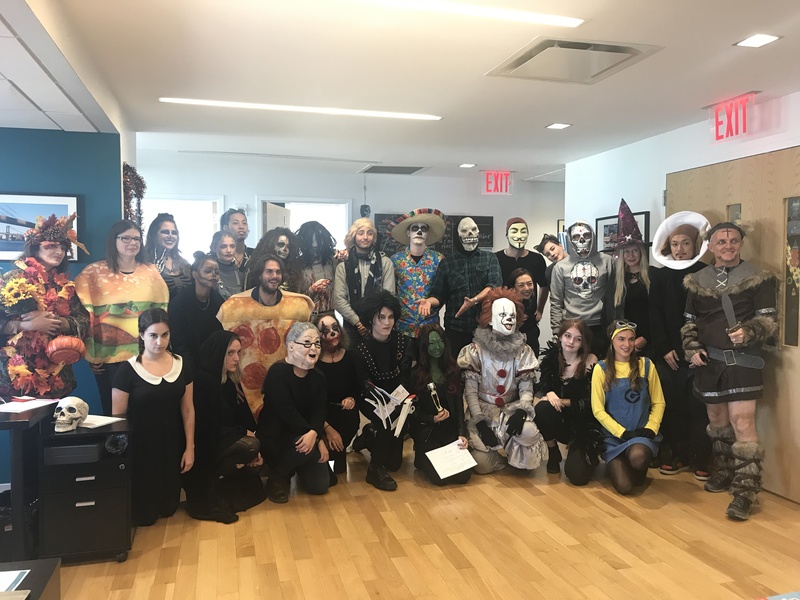 They are all very friendly and helpful, and it looks like everyone has fun in their jobs. Thank you so much for everything. You are so helpful, open-minded, curious, kind, and I felt in good hands. Warm-hearted! It’s amazing how you care about every single student. The staff is friendly, open and helpful. Madison is one of the kindest people I have ever met. From day one she was so warm-hearted to every student. Everyone is really nice, friendly, cheerful. Thank you for making this experience for unforgettable! Warm, friendly, attentive – everything was perfect. Perfect view, nice location, friendly and helpful staff. I love everything! Overall it was an amazing experience that exceeded all my expectations. I wants to thank you all for the excellent 8 weeks I spent there. The school is awesome. I learnt a lot and my speaking improved a lot. The small size of the school enables students to easily talk to each other. All the students come from all over the world, it is a way to be more open-minded. The staff is very kind and always takes care of students. BSL is the best school I have studied in. Everything was perfect but the best point is Rich, amazing, always in touch with the students, great job! 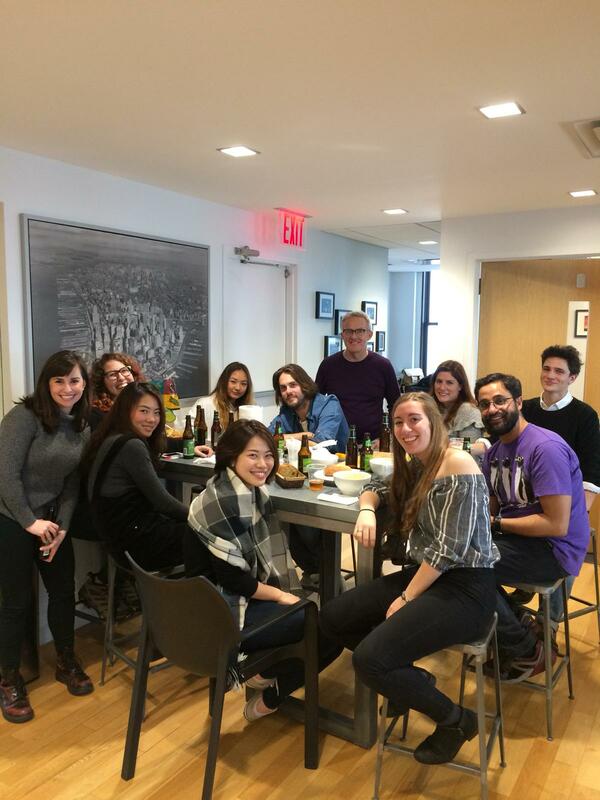 I had a great time attending English classes at Brooklyn School of Languages! Even though going back to school at a certain age may sound like a nightmare, all of you made this experience very easy. I had a lot of fun, loved the atmosphere, teachers, afternoon activities. There are not so many students so we are able to talk to everyone, I liked it. I made many good friends through the school activities and tried to be with them all the time to speak English. I really loved learning English at BSL, the school atmosphere is awesome! Thank you Rich and the team! I like the familiar atmosphere and the staff is very professional. I appreciate the concept with the weekly assessments and the personal progress reports. The location is perfect, in a very nice district of Brooklyn, and very close to Manhattan. And for me it is good that there aren’t so many Japanese students in this school. Easy to find, awesome view, clean, friendly and helpful staff – it has everything you need. No need to go to the Empire State or Top of the Rock, the school has a great view! I am very happy to learn English in this school, it’s fantastic! My teacher is excellent, very patient with us, and the staff is very friendly and helpful. Thanks so much! My teacher is very kind, friendly, dynamic, very spontaneous and respectful. She makes great lessons, it’s interesting and she knows how to motivate us. I liked that we started the morning with grammar and vocabulary (listening) and moved on with speaking and reading after the break. She made classes very interesting and fun. I could improve my speaking and my grammar in just 2 weeks. Each teacher taught in a different way but all of them did a great job. Every day was interesting and I learned so many things each day. It’s a fantastic school, the teachers are really good and fun. Cory is really a great teacher. He makes us participate, he puts us at ease. Thanks to him, I learned and progressed quickly. Ethan is very experienced and makes every class unique. The materials he used make the class enjoyable. Madison had a great style, empathy and gave great examples applied to real life. I really like how she teaches because I can understand everything and she has a positive attitude. I improved a lot and I am more confident now when I have to speak. I thank my teacher Baise because she is a good teacher and also funny! I think I learnt a lot because in class we can express ourselves freely, I was not uncomfortable. For the first time I enjoyed going to school! Ethan always makes sure we have fun while learning. I loved having Joanie and Lauren as teachers. Joanie is very interesting and sweet and I love Lauren’s energy. I like that there not many people in class and the lessons even at advanced level are challenging. I’ve done a few courses like this before and this is the best school I’ve seen. Although 2 weeks were short period, I believe that I learned a lot of things at your class, not only English as a language but also how to behave in the global business situation. Now I am full of motivation for making this chance as a turning point in my life. I think the business class is very well structured. There are a lot of interesting topics and the book is very challenging. I want to thank you about the two weeks that I spent in NYC. I really enjoyed my time at the school and I really was very satisfied about your lessons. It was my first English course abroad but your abilities in teaching and keeping the attention of the class really inspired me. Awesome class, lots of fun, comfortable atmosphere. The teacher was friendly and helpful. I gained confidence in speaking. The best English classes I’ve ever had. I learnt so many things and I am not afraid to speak anymore. I really enjoyed the BSL structure, the way they teach and the relationships with the students. The lessons were so fun and we learned so much. Now I can understand and speak better. Private lessons are very useful and the teachers bring very interesting materials and topics into class. I can tell they do very good research. The topics covered in class were helpful for conversation. We spoke a lot and learned a lot of new vocabulary. I like my Business English teacher, he is a pushing us forward in a very positive way. There’s a very friendly and easy atmosphere in class. The topics were interesting and relevant. We used a lot of different materials and learnt a lot of interesting of interesting expressions. I’m very satisfied because the classes at BSL don’t have too many students, so I had a lot of opportunity to speak at school. The English course was very good and gave me the opportunity to talk a lot. I think I was really lucky during my experience in New York because my host family is really great and the house is very well located. They are really attentive, polite and supportive. Everything was perfect! They are a very kind, friendly and helpful family. During dinner we talked about the day, school and other things. Aaron and Nicole cooked for me every night and the dishes were very good. Very friendly and kind family, interesting neighborhood. They gave me a lot of recommendations. Especially on weekends the breakfast was extraordinary! Very calm and friendly family, they helped every time I had a question. The house was clean. They are a very lovely family. They helped me a lot and answered every question I had. The house was clean the whole time. Our host showed a lot of interest in us and asked a lot of questions which made us feel totally welcome. And the food was delicious and well-balanced. The most interesting part of my stay was to meet my host Linda, who is a very interesting and nice person. She introduced me to her friends and shared with me her daily life. I felt like home, really nice atmosphere. I arrived late and they were waiting for me. I enjoyed speaking with them after dinner. Everything was as clean as my own home. The food was really good and she also taught me how to cook. They also gave me good recommendations about what to do and where to eat. I booked homestay B&B and it was very convenient because I had my independence. Tracey was very welcoming and kind, always helpful without even having to ask. She gave me very good tips to enter museums and other places without waiting at the entrance. Amazing family, very friendly and helpful. I felt very welcome and had an amazing time! My host mum Sonja is so helpful, friendly and very funny. And the food was delicious! I really felt at home, Emily is a welcoming and open-minded person. My host family is very kind and it was a pleasure to get to know her. Emily is a really kind and nice person. I enjoyed staying in her home so much! She welcomed me very warmly and I felt comfortable all the time I stayed with her. Plus her cooking is amazing! It’s always fresh, healthy a varied, I was very impressed. Years teaching: Though I’m pretty new to teaching, 8 months now, I’m pretty resourceful and have 2 years of experience doing bilingual community workshops. My current mission is to empower language learners through cultural awareness and language acquisition. University: I’ve got a Bachelor’s degree in Latin American studies from the University of Richmond, Richmond, VA and a TESOL/TEFL Certification from The New School, New York, NY. What is something about you that would surprise your students? I’m currently training to run a half marathon! What is your favorite pastime when you are not working? When I’m not teaching in the classroom, I’m out on the field training or on the courts playing volleyball. When I can, I’m dancing the night away to afro-Cuban beats, salsa and my all-time fave, Dominican bachata! Is there a good language learning tip that you give to your students? Pro Tip: Language is a living thing, so don’t get stuck on the rules (but do learn them!). It adapts to the changing times and it is therefore helpful to learn language chunks (how a native would say things) instead. What is your favorite part of teaching? Where to start!? There’s the cultural exchange, truly dedicated students, laughter, limitless creativity, no one class is the same, and most importantly students expand their opportunities for whatever that may be. “They have been very friendly with me. They treated me as if I was part of the family. I’m going to miss them. Years teaching: I have been teaching English for 6 years. University: B.A. in Communication Arts from The University of Wisconsin – Madison and Master of Education: TESOL from Boston University. Hometown: Have you ever lived outside of the United States? Yes, I lived and taught in Busan, South Korea for 4 years. What is your favorite thing about teaching? Honestly, I love the performance aspect of teaching. Meeting and interacting with students and watching them progress is great too. A good language learning tip for your students? Find any and every possible way to immerse yourself in the language. My sister and I were born four years apart, but we share the same birthday (February 10th). We also share our birthday with our sister-in-law. How did you start teaching ESL? I decided to become a teacher after graduating from college. I was living abroad, taking Hebrew classes. ESL teaching seemed perfect for me because I’ve always been interested in language, and I love coming up with silly activities to get people talking. Also, I had been a journalism student in college, and this seemed like it would be another great way to ask questions to people from different backgrounds. When I came home, I applied to graduate school, and started teaching at a language school in Manhattan. Um… They might be surprised to learn that I know how to juggle. Although I’m not very good at it, so they probably wouldn’t find it too surprising. Have you ever lived outside of the United States? I lived in Israel for half a year. What’s your favorite pastime when you are not working? Taking long walks and exploring the city. Is there a good language learning tip that you give your students? Just don’t take yourself too seriously. Have fun with it! I first started teaching ESL after I graduated from college. I really wanted to travel to France, so I applied to a program that allowed me to spend nine months teaching English in Corsica. I taught in two public elementary schools in the beautiful city that is Ajaccio. Who is your favorite film director? One of my favorite film directors is Wes Anderson. A lot of Hollywood movies lack any sense of originality. In my opinion, Wes Anderson’s films are a breath of fresh air. I think he has a great eye for composition, beauty and detail. I refuse to go on rollercoasters. I am afraid that I will somehow fall to my death. I grew up in the 80s, so I was really into British punk rock and had a pet rat that I named Chelsea! I always love to surround myself with water or trees, so whenever I can and weather permitting, I like to take little trips to the Hudson Valley area and spend time there with good friends. In the city, I love to see live shows of my favorite bands when they’re playing in town, check out some art exhibitions, stroll around farmer’s markets or flea markets, take pictures, dive into books and explore good eateries. Learning a foreign language is a long process; therefore, I believe that you have to love the language and its culture. If you’re dedicated, passionate and do whatever you can to immerse yourself in the language, the outcome will be evident. Don’t give up and have confidence! This might sound like a cliché, but as a teacher I get tremendous satisfaction when I see students improve and reach their goals. Hearing students outside of class use phrases or vocabulary that I taught them is priceless. I have lived and taught in both Vietnam and South Africa. Is there a good language learning tip you give your students? If you are not afraid to laugh at and with everything, including yourself, you will find that it is much easier to foster your English language identity. Is there a hidden gem in New York that you would recommend to students? The Chelsea galleries are the best and most affordable way to see art in the city. They’re always free and have openings for new exhibitions on Thursday evenings from 6-8pm where you can sample wine and mingle with other aesthetes. Yes. I have lived in South Africa, Spain, Germany, and Italy. Keep a journal, and write in it as often as possible. Songwriting. I play guitar, piano, and harmonica. Teaching teaches me everyday. In my classroom, I learn about the world, my students, and even myself. Years teaching: I have been teaching English for 4 years. University: I did my undergraduate degree in Spanish Literature at The Catholic University of America in Washington, DC and I did my masters in TESOL at The City College of New York. My favorite thing about teaching is how much I learn from the diverse experiences of my students! Also I like to share my sense of humor and love of the language in the classroom. Remember good things come to those who wait. Learning a language is hard work, but persistence will lead to the ultimate prize: communication and comfortability with the language. My birthday is on Christmas, aka Madison Messiah. That is how my New York adventure started. 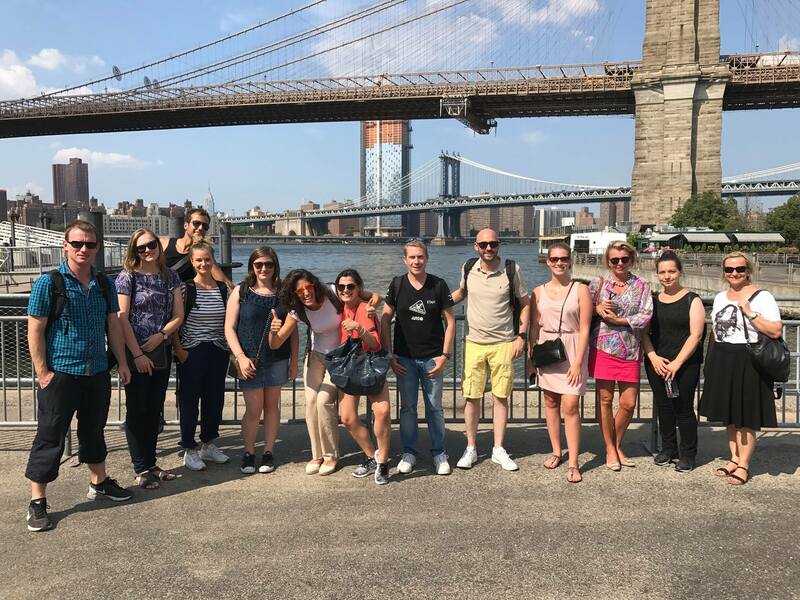 Two weeks in New York including flights, a language course at BSL and accommodation in a host family – all for free! Unbelievable! The first prize drawing of my life and then the top prize! When I had calmed down and stopped running and bouncing around in my flat cheering with joy I called my family and friends who couldn’t believe it either. That was back in February and I finally took off in September – from Munich via Frankfurt to New York JFK. Although a little bit tired I was very excited and curious to meet my host mother and see the accommodation. I took the subway and a New Yorker kindly carried my suitcase up the stairs – I must have looked as if I’d collapse from exhaustion. My first impression was definitely very positive! When I arrived at my new home for the following two weeks I was welcomed by my lovely host mummy Sharon. She showed me around the house and the neighbourhood. Many families live here in Park Slope and there are many little shops (second hand, antiques and accessories), bars and restaurants. Prospect Park is also nearby. After a restless first night (due to jet lag!) I took the subway to the school. It didn’t take longer than half an hour door to door. I was given a very friendly welcome at the school but the view from the window beat everything! The view from the 34th floor over Brooklyn Heights, Brooklyn Bridge and Manhattan is just amazing. ‘Wow’, all new arrivals were struck with awe. After calming down we introduced ourselves. Chatting to each other in English seemed so much easier here than at home. After a written and oral level test we were assigned to our classes. The level of English varied a lot among the students but there was a suitable class for everyone. During the break in the morning people gather in the kitchen for coffee and it is easy to start a conversation with students from other classes. People from France, Italy, Switzerland, Spain, Argentina, Netherlands, Japan, Germany – it is a motley mixture of nationalities and everyone laughs a lot. The school is small and has a family-run atmosphere. Richard, the school director, knows every student by name and the team is always helpful with questions regarding the school, accommodation or New York in general. We also had a lot of fun with the teachers during the lessons. Unfortunately, my English was a bit rusty since I had only needed it on a few occasions at work. It was therefore very beneficial that our teacher Gabi – who proclaims herself to be a grammar Nazi – jumpstarted my English again. There were several activities after school such as excursions to Brooklyn Bridge, a visit to a museum, and a Broadway tour as well as a Broadway musical. I went out a lot with my classmates. We went together to MOMA, to Lady Liberty and Ellis Island, to the Top of the Rock, Central Park, Times Square, and the cinema. And of course, the girls went shopping together. Also at night you didn’t have to be on your own if you didn’t want to be. We went out to eat in Chinatown and had an Octoberfest beer at a bar in Brooklyn (sorry, I am from Munich and Bavarian beer is just the best in the world). My time in New York went by incredibly fast, although I felt at the same time as if I had been there for months. The daily commute to the school and back home felt familiar very quickly and I was even able to help tourists find their way through the subway labyrinth. Two weeks in New York, however, were also very exhausting. You really need a break in Central Park to escape all the noise and hustle and bustle. On my last evening I went to Brooklyn Bridge Park to take a final look at the skyline of Manhattan and Brooklyn Bridge by night. We were all wistful when we said our good byes on the last day at school. I had a fabulous time in New York. Many thanks to everyone!